I recently sent some coins on behalf of some other collectors and myself to NGC and NCS. The coins that went to NCS were a mixture of slabbed and raw coins and in the case of slabbed coins, one hoped to get an improved coin and possibly a better grade by using their services. A week or so ago , a representative from NGC emailed me with the following: We have downgraded the NGC MS63 1897 Halfcrown (ZAR) to an MS61 and apologize for doing so. Would you please give us your view on the differing values so that we can make up for the difference. This happens very seldom. I duly went into Heritage Archive and extracted two prices of an NGC MS61 and a PCGS MS63 sold in the last two years and emailed them the values along with the respective lot numbers. The difference came to 388 USDs . They replied yesterday that they will refund me that amount. I complemented them on their professionalism and ethics. I also promised that I would do a posting so that all SA collectors and beyond could see what accountability means in coin grading. PCGS is known to offer the same. It is a standard for other grading companies to take note of and perhaps follow ? You sent an MS-63 to NCS for conservation, they conserved it, they downgraded it to an MS-61 and now they are compensating you for the difference? Wow, I didn't know they did that either. I thought that was at the submitters risk. According to the NGC census, the highest grade ever recorded for a Union Two Shilling (1923 -1960) in MS is MS65, so a grade of MS68 is truly unheard of. Even for Proofs, there is only one graded higher (PF69 for a 1948 date) and one equal (PF68 for a 1953) with all other 2/- graded lower even in proof condition. When I received the coin from a client to sell on BoB, it was part of a below average Union collection. Of the whole collection, I only picked two coins for grading being this one and a 1946 Half Crown that I hoped would grade AU but only got an XF45 grade. I sent the coin via NCS to NGC and when I received it back this week I could not believe my eyes - it is beautiful and looks proof-like. If it would sell for say R15 000 and on a second grading would grade proof (not MS) and say then sell for R1000, the owner would get R14 000 compensation from NGC if I understand George’s post correctly? That is a good question and I do not know the answer. You might want to ask NGC directly. I once bought a 1947 2/6 as part of a proof set. It came back MS-63 but with a note that it could use conservation. Before I tried to sell it, I sent it back in and it came back PR-63. The difference of course with your example is that I had mine conserved after it was already graded. If I had sold the coin with the first grade and someone else had sent it in, I don't know how NGC would have applied the policy. I haven't read it but I don't consider my example and yours a downgrade because the numerical grade didn't change. Its just that in these two instances, a proof is worth much less than a circulation strike and NGC made a mistake. I bought this coin ungraded as part of a full set from DNW because the 1947 1/ was described as a business strike and it came back MS-63. The 2/6 was described as a proof and when it came back "MS", I was (temporarily) pleasantly surprised. I wasn't surprised that the designation changed on the second grading. To give you a few other examples, NGC is certainly not going to compensate someone for a "mechanical error"; that is, an error in printing the label, such as exists on one of the 1926 1/ or 2/ mentioned here awhile back. Other possibilities where changes could occur are with die varities, CAM and DCAM with proofs and "special designation strikes" with certain US series. A lot less relevant to South Africa coinage but I'm not sure how NGC (or PCGS) would treat either of these. Of these three, I suspect that the most likely error would be with die varieties since the differences between many of them are insignificant and dozens are recognized for some dates. Oh and by the way, as an MS-68, I believe this 1947 2/ is worth a lot more than R15,000. Even in today's weak market, I suspect it might sell for only somewhat less as a PR-68. If this seems hard to believe, you can check my posts under "Scarce Coin Watch" on those "conditional rarity" QE II proofs which sold for about half this price on eBay. Those were farthing, penny and 6D which are smaller coins and only one (the 6d) was a PR-68. To give you a few other examples, NGC is certainly not going to compensate someone for a "mechanical error"; that is, an error in printing the label, such as exists on one of the 1926 1/ or 2/ mentioned here awhile back. I have decided to send the coin back to NGC for re-grading. If it comes back PF68 I will accept that it was a mechanical error on their side (they printed the label wrong) BUT if I comes back with a lower grading (either in MS or Proof), I fully expect NGC to compensate me as thy have done with George when they initially over-graded his coin. Seems reasonable. Here is the relevant extract from the NGC website. "If a coin were identified as a Proof, when, in fact, it is a business strike and the types are readily distinguishable from each other, this again would be a clerical error and not be covered by the NGC Coin Grading Guarantee." You mention that the coin looks prooflike. To my recollection, there are no PL KGVI in the combined census at this time. (There is one 1936 2/ and a couple of 1931 1/2D.) If the designation changes, i think it will be from this. What should I do regarding compensation from NGC for their erroneous grading? 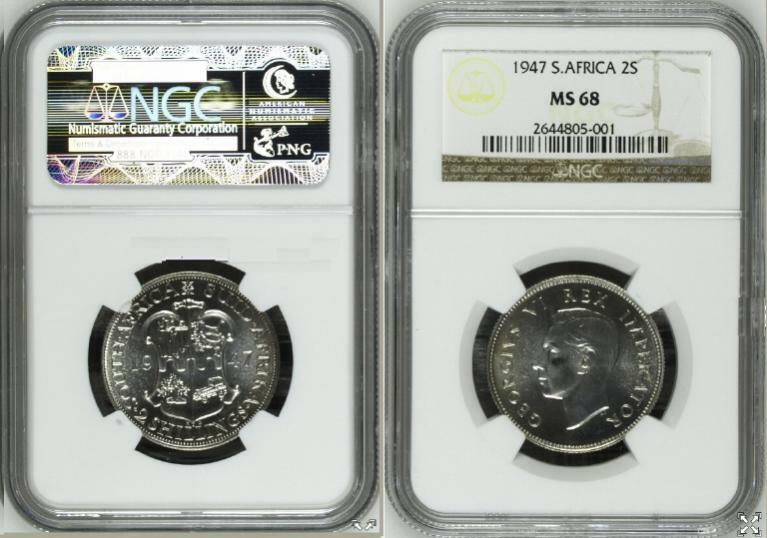 The South Africa 1947 2 Shillings graded MS 68 in this submission was incorrectly labeled as an "MS" coin and should be labeled as a "PF" coin. Unfortunately, after the graders reviewed it they believe that the grade should be lowered to PF 66. My interpretation of the grading guarantee is that you (or your customer) are eligible to receive the difference between the value of a proof 66 and a proof 68. The misclassification of the coin initially as a business strike is not covered. Since there isn't an established value for a PR-68 as none exist for this date or denomination, practically speaking, I don't know where this leaves you. I assume you can find a reference price for a proof 66 as their must be prior sales. For the 68, I would start with recent sales of other coins in the same grade, such as the examples I provided above which are described in my posts under "Scarce Coin Watch". Likely, there are some more in CoinGuideSA if you have access to it. I do not. Whatever compensation is paid is ultimately at NGC's discretion. I am not surprised this happened. Though I have not see the coin, I suspected it is actually a proof. Your description of the coin as PL is the primary reason and the second reason is that the number of Union coins which actually exist in the entire series as an MS-68 must be almost zero. Without looking at the census, the only one I recall is a 1936 3D graded by PCGS which Heritage sold for a pitiful $86 in the vicinity of the last 15 years. I once bought a 1959 2/ from a dealer in SA described as PL. When I received the coin, it didn't look like other proofs but not what I would expect of a PL either. There are no PL in the census for QEII (then or now) and when NGC graded in PR-63, I wasn't surprised either. It was a waste of money.